S -21° 27' 9" and E 47° 5' 8"
Fianarantsoa in Haute Matsiatra Region with it's 167,227 inhabitants is located in Madagascar about 178 mi (or 286 km) south of Antananarivo, the country's capital. Local time in Fianarantsoa is now 10:51 PM (Saturday). The local timezone is named Indian / Antananarivo with an UTC offset of 3 hours. We know of 8 airports in the wider vicinity of Fianarantsoa. 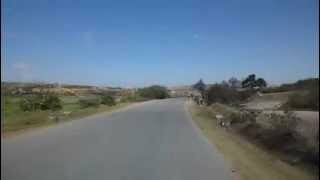 The closest airport in Madagascar is Fianarantsoa Airport in a distance of 2 mi (or 3 km), North-East. Besides the airports, there are other travel options available (check left side). Depending on your travel schedule, you might want to pay a visit to some of the following locations: Ambositra, Ambatofinandrahana, Manakara, Ihosy and Farafangana. To further explore this place, just scroll down and browse the available info. Let's start with some photos from the area. 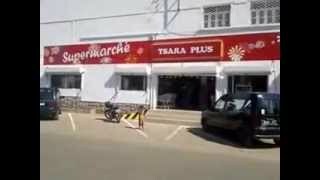 FIANARANTSOA ET SON NOUVEAU SUPERMARCHÉ TSARA PLUS. 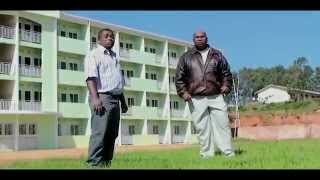 Testimonianze dal Madagascar: la Casa della Gioia a Fianarantsoa, scuola materna di SAN LUCA a Manakara, centro per il recupero nutrizionale a Manakara, centro per bambini disabili di Andemaka. 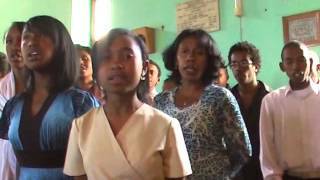 Horija zafindraony a/c RAZANADAHY Paul(PAUL BE) Andrainjato-Fianarantsoa. 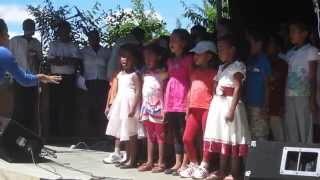 Les CM1 et CM2 de l'école René Cassin chantent lors de la journée de la francophonie à l'alliance française de Fianarantsoa. Antsan'i Salema FJKM Antranosoalaza Vavahadin'ny Lanitra Fianarantsoa. 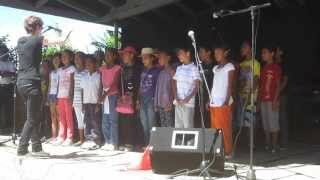 Les CE1 et CE2 de l'école René Cassin chantent lors de la journée de la francophonie à l'alliance française de Fianarantsoa. 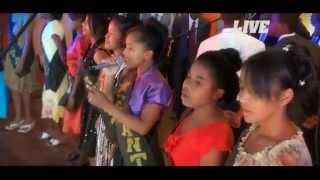 Pour honorer cette fête qu'est le Carnaval, les élèves de CM1 et CM2 vous chantent "Monsieur Carnaval"
Fianarantsoa Airport is an airport in Fianarantsoa, Madagascar. Located at -21.4417, 47.1117 (Lat. / Lng. ), about 2 miles away. Located at -21.45, 47.087 (Lat. / Lng. ), about 0 miles away. Alakamisy Ambohimaha is a town and commune in Madagascar. It belongs to the district of Fianarantsoa II, which is a part of Haute Matsiatra Region. The population of the commune was estimated to be approximately 22,000 in 2001 commune census. In addition to primary schooling the town offers secondary education at both junior and senior levels. The majority 90% of the population of the commune are farmers, while an additional 2% receives their livelihood from raising livestock. Located at -21.3167, 47.2167 (Lat. / Lng. ), about 13 miles away. Ambalakely is a town and commune in Madagascar. It belongs to the district of Fianarantsoa II, which is a part of Haute Matsiatra Region. The population of the commune was estimated to be approximately 6,000 in 2001 commune census. Primary and junior level secondary education are available in town. The majority 88% of the population of the commune are farmers, while an additional 0.5% receives their livelihood from raising livestock. Located at -21.4167, 47.1667 (Lat. / Lng. ), about 6 miles away. Andoharanomaintso is a town and commune in Madagascar. It belongs to the district of Fianarantsoa II, which is a part of Haute Matsiatra Region. The population of the commune was estimated to be approximately 20,000 in 2001 commune census. Primary and junior level secondary education are available in town. The majority 95% of the population of the commune are farmers. The most important crops are rice and grapes, while other important agricultural products are beans, cassava and potatoes. Located at -21.4667, 46.95 (Lat. / Lng. ), about 9 miles away. Andrainjato Centre is a town and commune in Madagascar. It belongs to the district of Fianarantsoaii, which is a part of Haute Matsiatra Region. The population of the commune was estimated to be approximately 10,000 in 2001 commune census. Primary and junior level secondary education are available in town. The majority 89% of the population of the commune are farmers, while an additional 6% receives their livelihood from raising livestock. Located at -21.4833, 47.1167 (Lat. / Lng. ), about 3 miles away. Ankarinarivo Manirisoa is a town and commune in Madagascar. It belongs to the district of Fianarantsoa II, which is a part of Haute Matsiatra Region. The population of the commune was estimated to be approximately 8,000 in 2001 commune census. Only primary schooling is available. The majority 99.5% of the population of the commune are farmers. The most important crops are rice and grapes, while other important agricultural products are pineapple and cassava. Located at -21.4167, 47.0667 (Lat. / Lng. ), about 3 miles away. Fandrandava is a town and commune in Madagascar. It belongs to the district of Fianarantsoa II, which is a part of Haute Matsiatra Region. The population of the commune was estimated to be approximately 9,000 in 2001 commune census. Primary and junior level secondary education are available in town. The majority 76.5% of the population of the commune are farmers, while an additional 12% receives their livelihood from raising livestock. Located at -21.5167, 47.25 (Lat. / Lng. ), about 11 miles away. Iavinomby-Vohibola is a town and commune in Madagascar. It belongs to the district of Fianarantsoa II, which is a part of Haute Matsiatra Region. The population of the commune was estimated to be approximately 10,000 in 2001 commune census. Only primary schooling is available. The majority 98% of the population of the commune are farmers, while an additional 0.7% receives their livelihood from raising livestock. Located at -21.3333, 47.0833 (Lat. / Lng. ), about 8 miles away. Ivoamba is a town and commune in Madagascar. It belongs to the district of Fianarantsoaii, which is a part of Haute Matsiatra Region. The population of the commune was estimated to be approximately 12,000 in 2001 commune census. In addition to primary schooling the town offers secondary education at both junior and senior levels. The majority 88% of the population of the commune are farmers. The most important crop is rice, while other important products are beans, maize and cassava. Located at -21.4, 47.1667 (Lat. / Lng. ), about 6 miles away. Isorana is a town and commune in Madagascar. It belongs to the district of Fianarantsoa II, which is a part of Haute Matsiatra Region. The population of the commune was estimated to be approximately 10,000 in 2001 commune census. Primary and junior level secondary education are available in town. The majority 80% of the population of the commune are farmers, while an additional 10% receives their livelihood from raising livestock. Located at -21.3167, 46.9333 (Lat. / Lng. ), about 14 miles away. Mahasoabe is a town and commune in Madagascar. It belongs to the district of Fianarantsoa II, which is a part of Haute Matsiatra Region. The population of the commune was estimated to be approximately 34,000 in 2001 commune census. In addition to primary schooling the town offers secondary education at both junior and senior levels. The majority 98% of the population of the commune are farmers. Located at -21.5833, 47.2167 (Lat. / Lng. ), about 12 miles away. 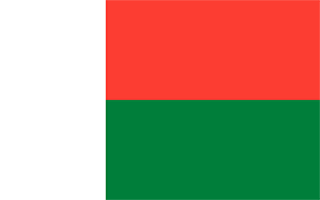 Mahatsinjony is a town and commune in Madagascar. It belongs to the district of Fianarantsoa II, which is a part of Haute Matsiatra Region. The population of the commune was estimated to be approximately 14,000 in 2001 commune census. Primary and junior level secondary education are available in town. The majority 98% of the population of the commune are farmers, while an additional 1% receives their livelihood from raising livestock. Located at -21.4167, 47.2 (Lat. / Lng. ), about 8 miles away. Soaindrana is a town and commune in Madagascar. It belongs to the district of Fianarantsoaii, which is a part of Haute Matsiatra Region. The population of the commune was estimated to be approximately 8,000 in 2001 commune census. Only primary schooling is available. The majority 90% of the population of the commune are farmers, while an additional 8% receives their livelihood from raising livestock. Located at -21.5167, 47.0333 (Lat. / Lng. ), about 6 miles away. Taindambo is a town and commune in Madagascar. It belongs to the district of Fianarantsoa II, which is a part of Haute Matsiatra Region. The population of the commune was estimated to be approximately 10,000 in 2001 commune census. Primary and junior level secondary education are available in town. The majority 97.5% of the population of the commune are farmers. The most important crop is rice, while other important products are beans, cassava and sweet potatos. Located at -21.4667, 47.15 (Lat. / Lng. ), about 4 miles away. Soatanana is a town and commune in Madagascar. It belongs to the district of Fianarantsoa II, which is a part of Haute Matsiatra Region. The population of the commune was estimated to be approximately 10,000 in 2001 commune census. In addition to primary schooling the town offers secondary education at both junior and senior levels. The majority 95% of the population of the commune are farmers. Located at -21.3833, 46.9167 (Lat. / Lng. ), about 12 miles away. Talata Ampano is a town and commune in Madagascar. It belongs to the district of Fianarantsoa II, which is a part of Haute Matsiatra Region. The population of the commune was estimated to be approximately 15,000 in 2001 commune census. 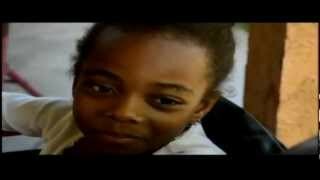 Primary and junior level secondary education are available in town. The majority 86% of the population of the commune are farmers, while an additional 5% receives their livelihood from raising livestock. Located at -21.55, 47.0333 (Lat. / Lng. ), about 8 miles away. These are some bigger and more relevant cities in the wider vivinity of Fianarantsoa.